How many times have you participated in a workout that could be described as a “massacre”? How often have you woken up at 4 a.m. to make sure you were on time for an event that involved intense physical exertion combined with complicated mental recall and reasoning? And while doing all that, were you taking college-level courses with class, studying, and midterms? If you have done those things all in a short span, I’d say you’d earned some kind of celebration when it’s all over. 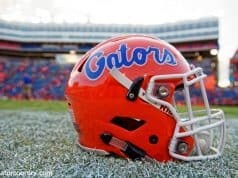 The Florida football players have, and that’s what the Orange and Blue Debut will be on Saturday. To be sure, it’s still going to have some elements of a practice. 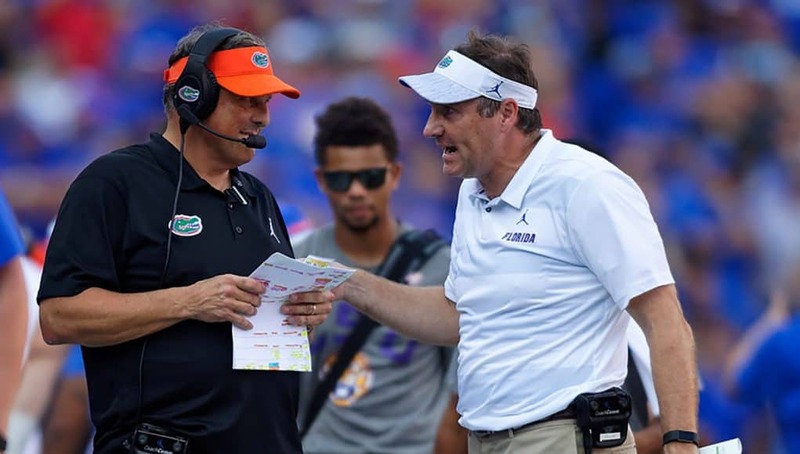 Dan Mullen mentioned in his Monday press conference that he and Todd Grantham each will sometimes run the same thing several plays in a row to make sure they see certain things on the game film. They want to make sure that the things they’ve been working on show up inside the stadium. But for the most part, it’s going to be less a final exam than it is a chance to blow off steam by doing just the fun stuff. It’ll be something of a family reunion too with former players around. Mullen has hinted that there could be more combining of the fun and family parts during the game like last year. I know that’ll make some of you roll your eyes, but Saturday is not a day for being deathly serious. It’s a day for feeling how it’s great to be a Florida Gator — complete with a bevy of sporting events and family activities as is the recent custom — and for working on making some new Gators in the process. You can see how important the in-person recruiting aspect of the Orange and Blue Debut is in the very timing of the game. Mullen and his staff decided that 1 p.m. is the best time to have it start. They can sell the program beforehand in the morning and, after what Mullen promised will be precisely two hours of scrimmage, there will be time for more selling afterward. Recruits who live not too far away will also have the chance to make it back home on the same day if their families choose, something that will make parents happy. As a result of previously scheduling the Auburn-South Carolina softball game at noon, the main SEC Network will not carry the game live. Florida could’ve worked with the network to pick a different time to make sure it would hit cable and satellite, but it didn’t. Maximizing the experience for the recruits who make the trip won out. Instead it’ll be on “SEC Network +”, which is to say it’ll be available on the ESPN app on mobile devices and streaming boxes. So, if your primary interest in Saturday’s proceedings is real, meaty football discoveries, I’ve got bad news for you about this (and literally every other) spring game. Even so, there are five players I’ll be looking for just to get an idea of what they’re potentially capable of. It’s not often that a graduate transfer comes in a wins a starting job straight away, but Greenard has done it. He had a leg up both from having played for Grantham at Louisville and given Jeremiah Moon’s absence due to injury. He’s the new Jachai Polite… or is he? The reports are that he’s bigger and stronger and better against the run while not being as fast a pass rusher. I want to see how different he looks at Buck than the guy he’s replacing. Every story about him agrees that he’s become a matchup nightmare: too big for a corner or safety to cover while too fast for most linebackers. Let’s see what that looks like when he performs more than just the basics he was doing in the second half of 2018. With Marco Wilson still recovering from his ACL tear, the early enrollee Steele was thrown in the deep end by running with the 1s from the beginning. He had a rough start, which is understandable for someone who my Big Book of Sportswriter Cliches tells me should be getting ready for prom right now, but he’s been improving by the day. He’ll probably get burned at some point, but I’d like to see him make a big play to show how secure the future of DBU is. Jawaan Taylor left for the NFL and Florida might have a starting tackle who’s even bigger than he is this year. Forsythe is two inches taller and we’ll see what his listed weight is, but he’s about as big as tackles get. He’s the most important of the four new starters as the left tackle and the one I want to see the most. Brett Heggie has started before, Chris Bleich will be inconsistent as a redshirt freshman, and Jean Delance was hobbling a bit the last time the media got to watch the team. Forsythe hasn’t played much, is a veteran, and doesn’t have any known injuries. He’s the one I’m most curious about on Saturday. Now that he’s fully healthy, Davis has been getting rave reviews in the spring. With Mullen already having said he’s not going to spend a lot of time getting reps for the proven veterans like Lamical Perine specifically, Davis should be the top featured back. Vision was his best attribute when he was rolling up the yardage in 2017, and that’ll be important behind an offensive line trying to find its way. Will he still show that same ability? There are plenty more I could mention — Amari Burney as a linebacker is a big one, and Feleipe Franks has reportedly distanced himself from his competitors — but those are my big five. You will have your own set of players you want to see, and you’ll see them at least a little bit. You’ll ideally see them having fun with their friends and teammates, and if all goes to plan, the recruits will be having fun too. That’s what the Orange and Blue Debut really is all about: having fun. Things will get serious come August. 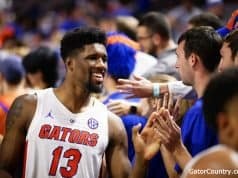 For now, just let loose and enjoy your first peek at what the 2019 Florida Gators will be.